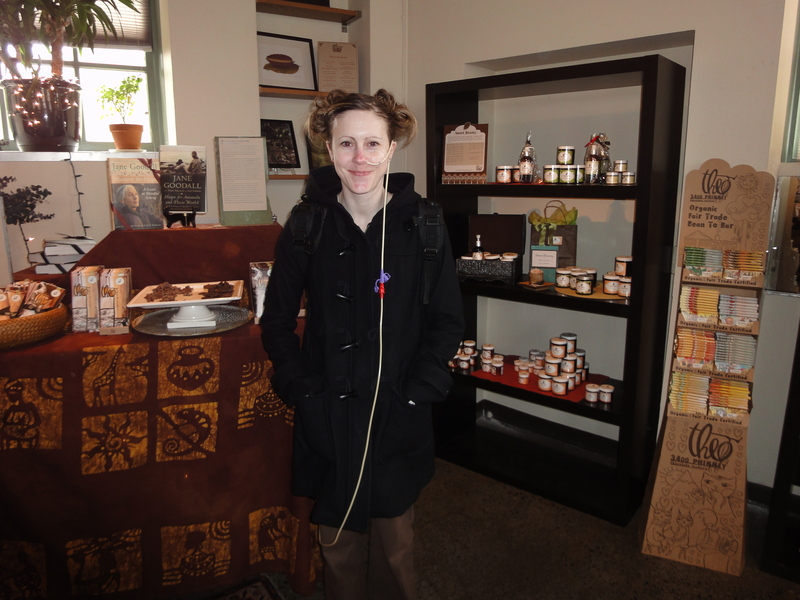 Back when I failed all attempts to cure or control my gastroparesis through medication, I was losing weight, and losing it fast. My blood tests were not very encouraging either. I would not be a candidate for the gastric neurostimulator surgery at such a low weight (95 pounds at 5’6″), so my doctor decided to place an tube in order to get my weight up for surgery. This was placed back in November, 2009. Because it is a Nasojejunal feeding tube and not a nasogastric feeding tube, it must be placed with the aid of a flouroscopy machine, a type of moving x-ray, in order to confirm correct placement of the tube in the upper jejunum (the second section of your small intestine). For me, I was given sedation for the procedure. I was not awake nor do I remember any part of the procedure. I recommend this method if anyone is looking to have an NJ tube placed. I woke up an hour after the procedure with a tube taped to my face and was able to go home shortly after. No hospital stay required and it was done by my gastroenterologist. 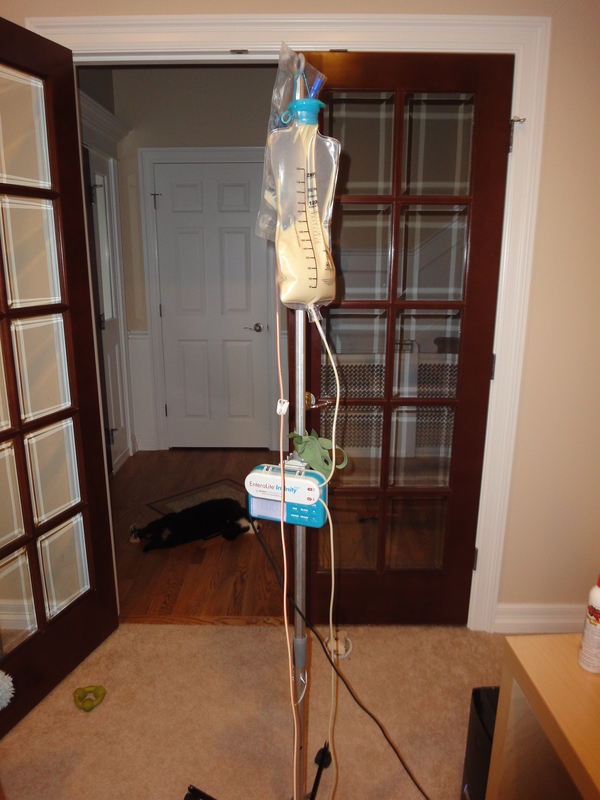 Later that evening my home care company came by to teach me how to use the tube, how to fill my bag with formula and taught me how to use and set the pump to the volume and time I needed. It was a dietician that came to my house that night, so she knew how much and how fast to feed. It was really easy. My NJ tube came with many complications, however. It was constantly kinking up. 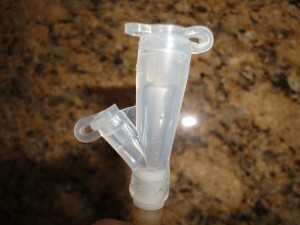 The end of the tube would flop over on itself, preventing formula from flowing through it. When I realized that I couldn’t get formula through my tube, I scheduled appointments with my gastroenterologist, who then took x-rays to check the position of my tube and to look for kinks. Each time, one was found, and each time it was in a place that could not be unkinked without a straight up replacement of the tube. 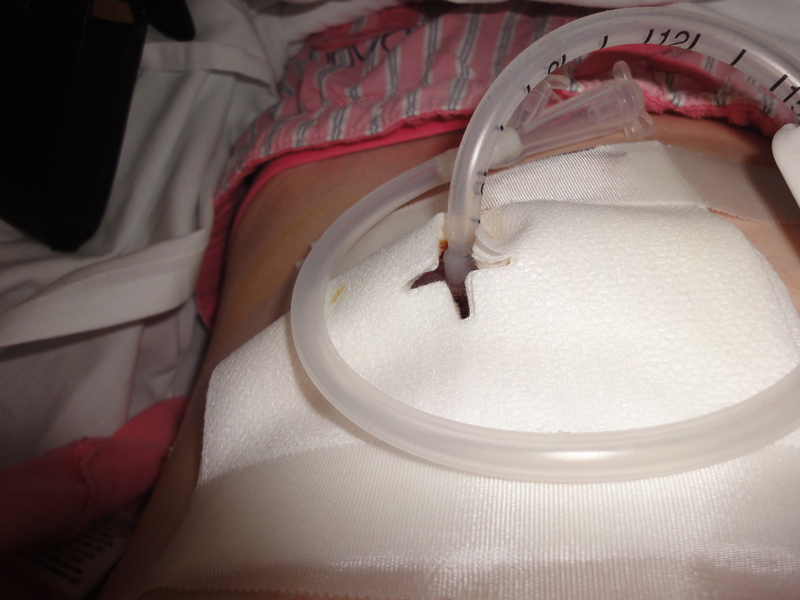 When I required a new tube, I required sedation and a day of recovery. This happened each month during the excruciatingly long 6 months I had the NJ tube. 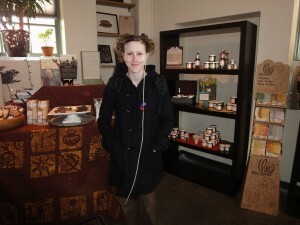 I suffered sinus pain during my use of the NJ feeding tube as well as ear and throat pain. Only a new tube seemed to calm the pain, even if it only lasted a few days – I enjoyed being pain-free. 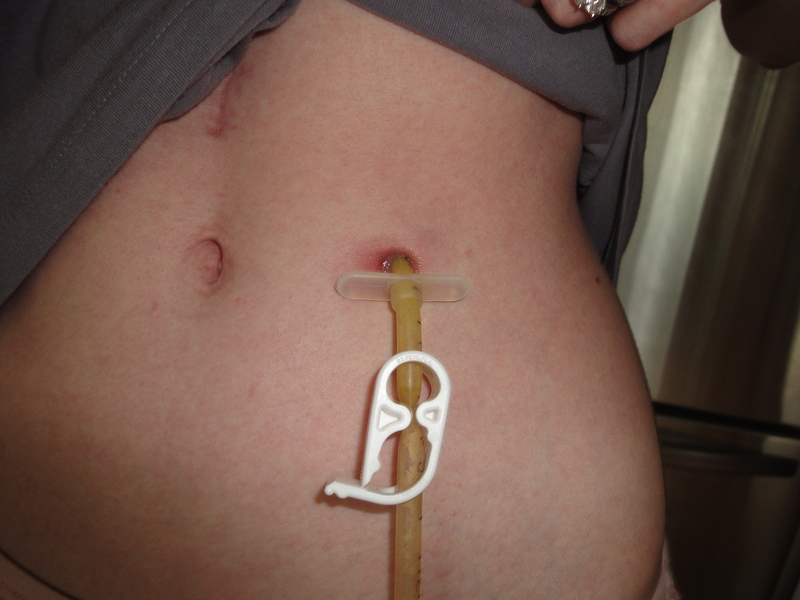 An NJ feeding tube is not meant to be used for such an extended period of time and after a few months I began asking for a permanent feeding tube to be placed. 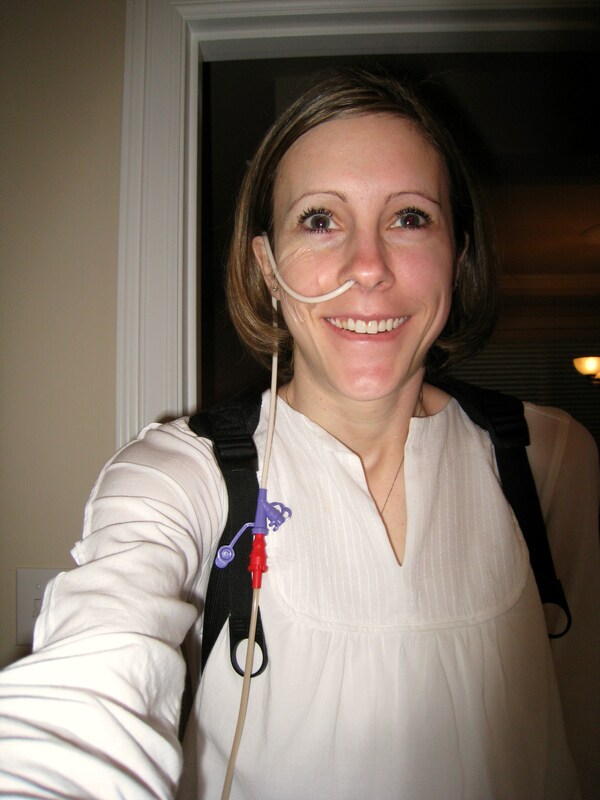 They were confident that when I got my gastric neurostimulator, I’d be able to maintain my own weight and nutritional status through oral feedings alone. 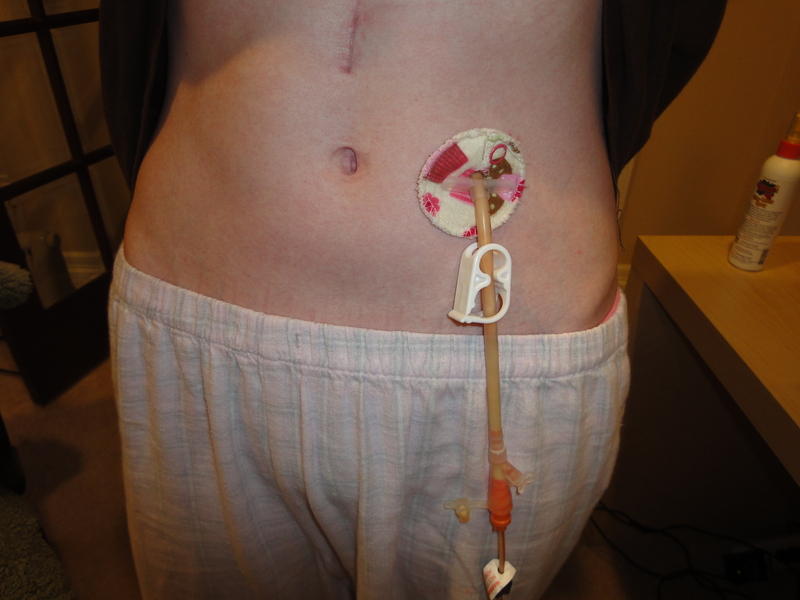 So I endured more months with this tube but a few months after the stimulator was placed and I still felt I could not keep my weight up without the tube, my doctor ordered a permanent jejunostomy feeding tube. On April 8th, 2010, I received my long-awaited jejunostomy feeding tube via endoscopy (it was placed endoscopically versus an open procedure). 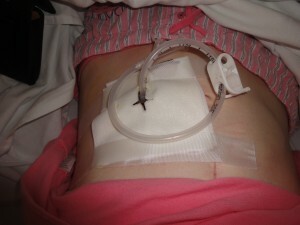 My feeding tube was placed under sedation as well. It required an over-night hospital stay. It surprisingly was not sore at all. I had to wait 24 hours before I was able to feed using the tube. I didn’t use any dressing on it once the surgical dressing was removed shortly after I got home. I was told that keeping it dry and clean was the best thing for it and to not suffocate it with layers of gauze and tape. My tube is held in place with a non-balloon bumper, so I was told to never twist the outside tube around. I was also told not to move the external bumper closer to the skin as that would bring my intestine up to the abdominal wall and possibly cut off circulation to that part of the intestine, resulting in tissue death and even more serious complications. Alrighty, don’t touch the bumper! Got it. I was just excited to finally have the tube out of my nose even if it was simply exchanged for one in the abdomen. Because I was previously feeding with a nasojejunal tube, nothing about the schedule, rate, formula or even connectors changed. 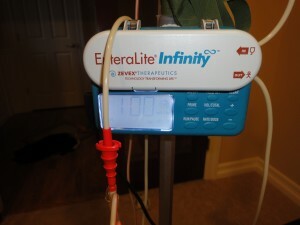 I still use a christmas tree adapter from the feeding bag itself which connects into a Bard 333 that is connected to my size 22FR feeding tube. This adapter is able to be changed out when it either no longer works or gets too dirty. Sometimes the caps on top become loose or fluid collects in it, causing it to smell something foul. When it is changed out you just unscrew it from the tube, trim the tube if necessary, and pop in another one. My connector has 2 ports. The bigger one I plug the christmas tree adapter feeding tube into, and the other smaller port I use to flush medicine through. 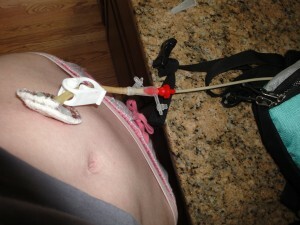 I also use a hose clamp to make sure that when the ports are open for medicine or closed when not feeding, that everything on the inside of me, stays on the inside of me. It really only takes one mistake of leaving it open to learn to keep it closed. Intestinal fluid will come rushing out like an exploding volcano and you will quickly realize what happened and rush to clamp it shut. Getting a hold of these for replacement is difficult but you really shouldn’t ever need it replaced anyway. The top shows a slight infection, which I am still fighting with antibiotics and a follow-up with my gastroenterologist, and when it gets infected, I think it is best to leave the stoma undressed. But, when it is healthy I find these Cloth G-Tube pads to be wonderful. I get the girl patterns just to have fun with stoma dressing. You take it where you can get it. I’ve invested in a few of these and since they are machine washable, I haven’t had to use gauze ever. These things really do keep the moisture and other gunk that leaks from the site, clean and away from the skin. I recommend them to everyone with a tube stoma! This is sort of the setup I run when I’m at home and am using a pole. I sport the Zevex Enteralite Infinity pump. It is amazing. It is quiet, accurate, and will run in just about any position with an excellent battery life of 24 hours at a rate of 120ml/hr. I also use their mini and regular backpack for when I need to take my pump and feed while outside the house. I don’t feel I am limited at all in any activity and have even rock climbed while feeding. I’ve also invested in Tummy Tunnels, while out and about with my tube. It makes accessing my tube easier and also keeps it from pulling on the site. Feeding by tube isn’t the best situation one finds oneself in, but it definitely isn’t the worst either. You do what you need to do to live and it just becomes a new normal. 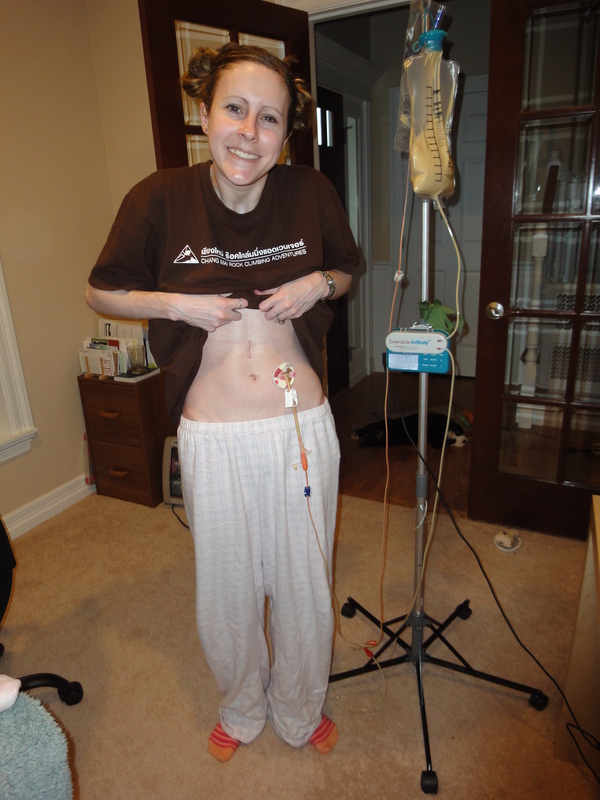 Feeding by tube has saved my life as well as time in the ER and I am just thankful to have it. What is the stimulator and where is it placed? Adverse effects? 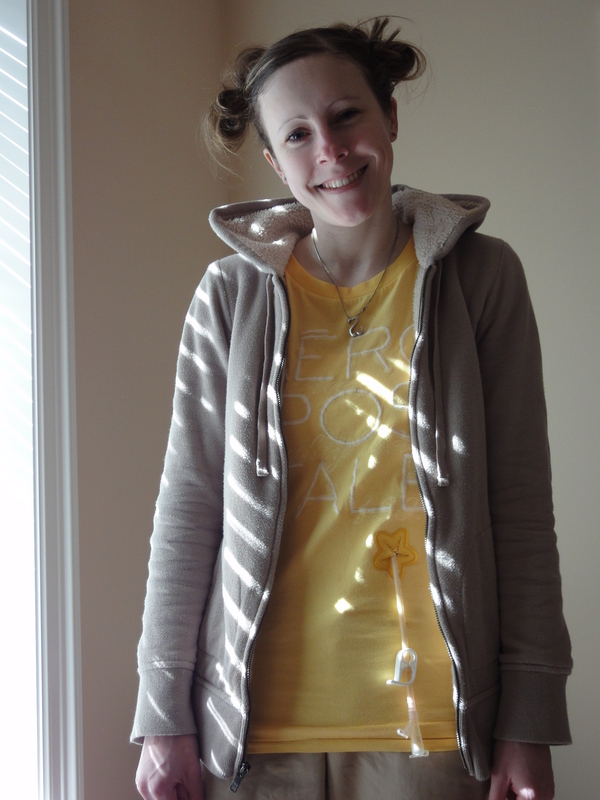 I have gastroparesis and exist mainly on ensure. And for those who can’t gain adequate weight to maintain a healthy weight, try the high calorie Ensure. You can drink all your stomach can manage to deal with. What I need to find out is how easily Ensure can be digested as I am still bothered sometimes by no bowel movements and eventual unannounced diarrhea. Help! I am wondering about tubes but I am scared. Anyone??? I admire you. I am a nurse. Thank you for sharing your story. Keep going, beautiful woman.